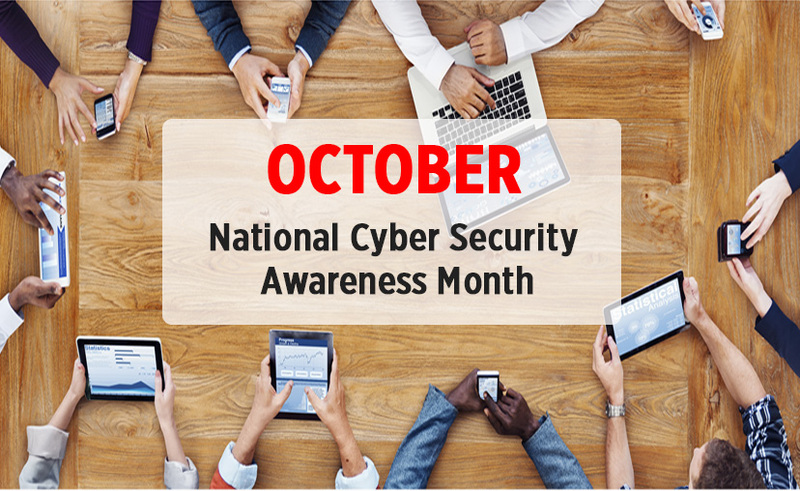 UT Health San Antonio joins a national effort amo​ng universities, businesses, government agencies, associations, nonprofit organizations and individuals to promote online safety awareness by becoming a Champion for National Cyber Security Awareness Month (NCSAM). As an official Champion, UT Health San Antonio’s Information Security team will be hosting on-campus events this October to raise awareness on how to have a safer and more secure online experience. Weekly events will focus on aspects of cyber security and the many ways it impacts our daily lives. Discussion of Cyber Common Sense; a breakdown of common cyber threats and techniques to protect yourself. Click HERE to view this presentation, recorded on October 10, 2018. Ever wondered what a hacker sees on their computer screen during a cyber heist? Watch a live demonstration by the FBI to witness how easy it is for hackers to obtain sensitive information at their fingertips. This event is back by popular demand based on last year's success and has been updated to reveal this year's most current threats. The FBI today is considered one of the world’s premier security and crime-fighting forces. Reporting to both the attorney general and director of national intelligence, the Bureau has dual responsibilities as a law enforcement and intelligence agency. Our priority is to help protect you, your children, your communities, and your businesses from the most dangerous threats facing our nation—from international and domestic terrorists to spies on U.S. soil, from cyber villains to corrupt government officials, from mobsters to violent street gangs, from child predators to serial killers. Along the way, we help defend and uphold our nation’s economy, physical and electronic infrastructure, and democracy. Click HERE to view the FBI Hacking Demonstration recorded on October 24, 2018. Free Shred Day has been rescheduled due to rain. The annual UT Health Shred Day will be held at the flagpoles near the main entrance to the Long Campus in front of the School of Medicine Building. 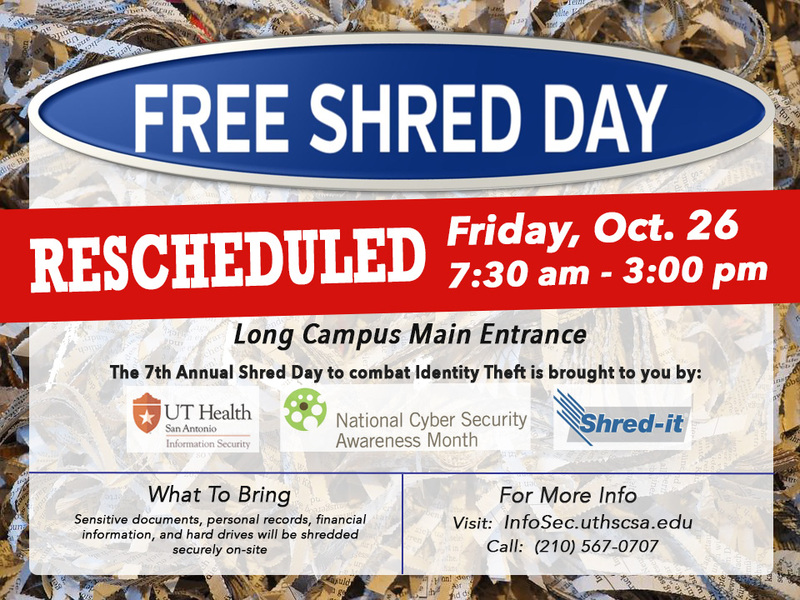 This free event allows faculty, staff, and students to shred sensitive work papers and other personal documentation on-site. If you have sensitive financial information like tax documents, loan forms, old credit card information, or expired checks, these can also be safely disposed. Departments can also bring computer hard drives and other media to be shredded during the event. This includes USB devices, floppies, tapes, ZIP, and JAZ drives. All material must be delivered before 3:00pm. There will be 10 gray Shred-it bins available from Oct. 22 through Oct. 26 throughout the Long main campus hallways for employees and students to securely discard documents for shredding. One of our Shred Day goals this year will be to get old computers off the inventory. Property Control and the tech support crew of ITSM will be setting up in room 106 of the ALTC to accept computers to be taken off inventory. Bring them down with a completed Property Deletion Request and Electronic Data Storage Device Disposal forms (links below). The deletion request (Form #1) asks if the device(s) ever had storage and the electronic disposal request (Form #2) acknowledges that all data has been erased. Both forms must be filled out, even if the hard drive was removed.